The PowerArm™ baseball training exercises and arm strengthening will help you hit the ball farther plus throw the ball harder and faster. Success in baseball is requires explosive and powerful arms. The PowerArm™ is the training aid that provides you with the baseball training exercises needed to increase bat speed, give your curve ball a more devastating drop and protect you against arm, wrist and shoulder injuries. Maintaining strong arms will furthermore help you better perfect your mechanics, as a greater degree of tone, means a greater degree of muscles control. Using the PowerArm™ will provide the serious player with the baseball training exercises and arm strengthening needed to attain peak performance and improve their overall game. The “snap” the player achieves from having strong wrists and forearms is crucial in improving swing speed and controlling the direction of the bat. The arm strengthening PowerArm™ device is small, lightweight and easy to add to any gym bag of just lay it beside your bed or desk at home. Pick it up and do 10 - 15 minute workouts multiple times during the day. 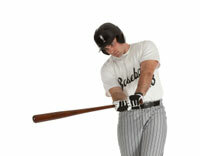 There are simple baseball training exercises included with each product. The PowerArm™ helps build the hand speed and wrist action necessary for a smooth, consistent swing of the bat and/or throwing the ball. All skill levels of baseball players who are seeking baseball training exercises will experience increased bat speed, ball flight distance, improved arm range of motion, plus the improvement in a combination of strength and muscular dexterity from using the PowerArm™. The PowerArm™ provides a dynamic user-adjustable resistance workout that will isolate and strengthen key muscles groups and help prevent painful injuries such as tendinitis, sore elbows and painful wrists. Being able to increase the velocity and accuracy of throwing a ball requires strong and flexible wrists and forearms. Using the PowerArm™ and specific baseball training exercises will deliver results.